And I bore the onslaught of insult. (These are the excerpt of a poem Kumari (Virgin) in Amrita Pritam’s Jnanpith Award-winning Kaghaz Te Canvas ). 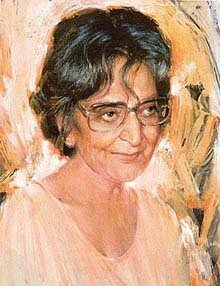 Amrita pritam, the most known Indian writer had left her husband in 1960 for her lover Imroz, an artist and writer. For more than four decades, they were inseparable and supremely happy, and he designed most of her book jackets. He survives her, as do a daughter and a son from her marriage. During this time she had also love affairs with Punjabi Muslim poets - the well-known Sahir Ludhianvi and remained with Imroz and Sahir without any confrontation. A young Amrita Pritam, madly in love with Sahir, wrote his name hundreds of times on a sheet of paper while addressing a press conference. A bachelor to the end, Sahir fell in love with writer Amrita Pritam and singer Sudha Malhotra, relationships that never fructified in the conventional sense. I go to read more a little of the writing of the Amrita. I know very little. nice blog but amrita did not leave her husband for imroz but because she felt her soul languor with her husband. she found imroz after years of loneliness. she never stayed with imroz n sahir together but she did live the memories of sahir but she did respond to the love of imroz. liked your post on kamala das. i came first time to your blog , i liked all your postings and specially on Kamla Das . and also on the paintings . hi, I am looking for the original punjabi version of the poem- The virgin- by Amrita ji. Can anyone help.